actually made from meat scraps left on the butcher's block. flavor the stew pot, and add meat to the diet at a cheap price. Only, sold as a prime filet, it doesn't retail as scrap meat. The video, above, was shot in Australia. It talks about the use of transglutaminase (also known as "meat glue") that magically turns scrap meat into what looks like a prime filet. In Europe, cuts of meat that are glued together with transglutaminase are now referred to as "Frankenstein steaks." Transglutaminase is a family of enzymes that catalyze the formation of a convalent bond between peptide-bound lysine proteins and gamma-carboxamid proteins (i.e., glutamine) that form extensive cross-linked insoluble protein polymers. The body engineers glutamine to form things like skin and hair and to create coagulation (blood clots) that keep you from bleeding profusely from a minor cut. The European Union banned the use of transglutaminase in 2010, but it was still legal in Australian when this video was made. 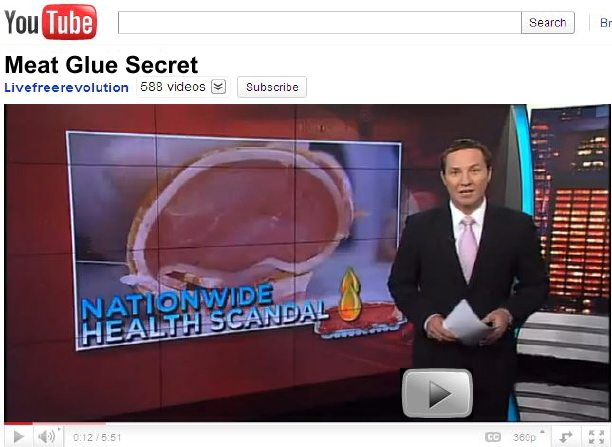 In the United States, the FDA says transglutaminase is safe. The USDA has approved its use. It carries the FDA designation "GRAS" which means "generally recognized as safe." What that means is that products carrying the GRAS label are exempt from the requirement that forces manufacturers to test the additives they place in the food you eat before they put them on the marketif experts who are qualified by scientific training and experience to evaluate their safety without conducting any tests say they are okay. In commercial food processing, transglutaminase is used to bond food proteins together. The first uses of transglutaminase was to processed meat products like artificial crabmeat and fish balls. Today, with skyrocketing food prices, it is used to make 'bargain" filet mignon out of the meat scraps left on the butcher's block after the better cuts of meat are trimmed. Transglutaminase (now commonly referred to as TG or TGase) has been used since the late 1960s to emulsify meat products like skinless sausage and hot dogs. It is used to improve the texture of low grade meats that previously had been used only for processed meat products. And, today, it is used to bind different meat parts into larger solid meat units (i.e., the ability to restructure steaks). Transglutaminase is used to create meat or fish noodlesa new culinary experience. And to create interesting food experiences like combining lamb and scallopsand the latest craze, bacon spirals, with people asking: "How did they do that?" I have found scores of websites that claim links between transglutaminase and various diseases, but no real evidence has yet been found to conclusively substantiate any of them. Celiac Disease [CD] comes closest since transglutaminase is a gluten protein and CD is a disease that is intolerant of gluten proteins. When scientists find the negative health issue with TGase, I believe it will be one attributed to a multiplicity of nondescript food preservative additives that contribute to a universal health problem experienced by a majority of the people in Americaexcess belly fat. The fat you can't ever seem to get rid of regardless how hard you exercise and how fastidiously you diet. Because the food preservatives that prolong the shelf life of processed and packaged foods we eat also act to prolong the "shelf life" of the foods after they are consumedmaking it harder for your digestive system to break down the foods in your stomach and help excrete them from your body. Much of that digested food is stored for further "processing" in the lining around your midriff which becomes that unsightly innertube we call belly fat. So, all I can say about that Frankenstein prime filet you had for dinner last night. I hope you enjoyed it because it could be with you for a long time.